You’re probably already planning your annual summer vacation. Have you considered going someplace you can’t drive to? It might be time to think outside the box and visit a far-flung destination. Make this summer a once-in-a-lifetime experience. Forget the Midwest and travel to the Middle East instead. Or how about the Far East? Wherever you decide to go, make sure it is not near. Whether it’s sand dunes or sushi, try something different this year. If you are traveling to the Middle East, India or Nepal, Hyatt hotels are doubling Emirates Skyward Miles. There are 33 participating locations, many of which are luxury hotels. Rewards vary based on the hotel you choose. Shangri-La Hotels and Resorts are also offering double Emirates Skyward Miles. For a limited time, guests can earn 1,000 miles per stay instead of the standard 500 miles. They also receive a fourth night free when they book three nights at the best available rate. There are 10 participating locations. Rooms must be booked by June 26, 2015, and stays must be completed by June 30, 2015. You can earn 2,000 Virgin Australia Velocity points for staying at select Jumeirah Hotels & Resorts. They have locations in the Middle East, as well as Europe and more exotic locales like the Maldives. Jumeirah Hotels offer a high-end, luxury experience. To receive these Velocity points, you must use promo code VELOCITY. If you are considering traveling to Japan, you can earn bonus ANA miles by staying with Marriott. Guests can get up to double Mileage Club miles. Certain upscale Marriott brands, such as Renaissance Hotels and Marriott Vacation Club, earn two miles per dollar. The more economical brands, including Courtyard and Residence Inn, earn one mile per dollar. If you were unaware of this offer from ANA, and you’ve stayed at a participating Marriott location within the past six months, you can still get the bonus miles. The airline has a unique feature which allows patrons to retroactively apply for miles. While in Japan, you can also earn American Airlines miles. 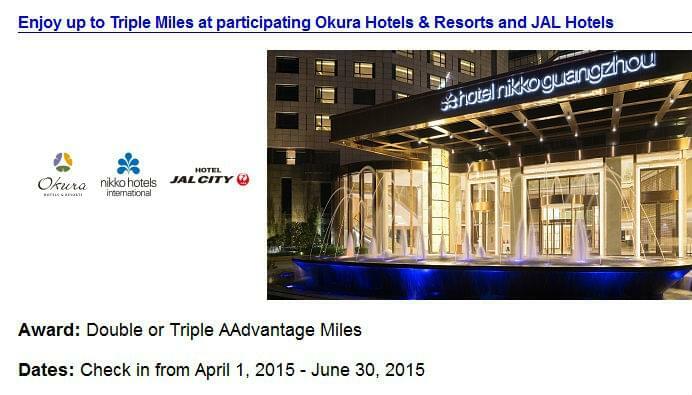 Hotel JAL City, Okura Hotels & Resorts, and Nikko Hotels International are all offering double AAdvantage miles. Hotel Nikko Guangzhou is tripling the standard earn. The total number of miles earned depends on the location, but an average stay receives anywhere from 400 to 1,500 miles. In addition to the bonus miles, guests also get a 10 percent discount on the best available rate. So take a break, have an adventure and earn some bonus miles in the process. Keep in mind, there may be blackout dates and these offers cannot be combined with other discounts and deals. Always provide your frequent flyer account number and reference the promotion when booking.